Even though Google offers many web applications that could replace traditional software, the integration between them is barely visible. The closest thing to an online desktop that displays your favorite applications is iGoogle, where you can set up themed tabs like this one. To switch from Gmail to Google Calendar, you'll click on the navigation bar and open a new window or tab. While you can always resize the windows and keep both Gmail and Google Calendar visible, it would be nice if iGoogle provided a way to freely move the gadgets inside the window, like in yourminis.com. With the addition of Google Desktop gadgets and the customizable layouts, the personalized homepage could really replace your desktop. But gadgets need to be more powerful and offer more than a list of links. Ideally, the Gmail gadget should have an expanded version that lets you read messages, compose mail and search inside the archive. Max designed a small proof-of-concept that groups many of Google's web applications. "I think that it would be a good idea for Google to group all of the online applications in to a single web application. Something like an eDesktop," he writes at Google Groups. 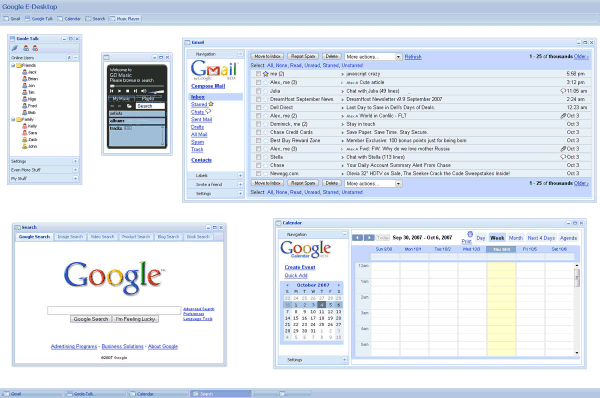 Max's vision for a Google eDesktop. Click to enlarge. I agree completely...this is long overdue! There's little cross-integration built into some services (i.e. adding events from emails in Gmail), but nothing on a large scale and it's becoming more and more obvious that this is necessary for people to make full use of their services. I think like integrating Google Gears into their current offerings, they haven't given this a high enough priority and it's taking a lot longer than it should. I think this is really cool! What is the widget used for the music player ? What it Google really needs is an alternative to MS LookOut. The single, encompassing application is a powerful concept and I think it would do Google well to build something like it rather than to just have lots of little window applets open. Integration would be good, but not like this. It should integrate the way Windows Live is starting to do. Real integration is more than just putting different apps on the same screen -- the underlying data needs to be integrated. This isn't integration -- this is the applications each sitting next together. What Google needs is real integration. Can anyone enlighten me as to why one of the most useful (to me) features in Google seems to have been disabled? In Search, I used to be able to type a last name, city and state, and the phone numbers of those with that last name would come up. It was compulsively handy. It doesn't work anymore. A privacy issue? Other? How is what is pictured different from having several different browser-sessions and programs (or even just different widgets) opened and spread about your desktop? And how does this make me more productive or make the access to those things easier? What iGoogle needs is a Blogger widget that lets you post to your Blogger blog directly from iGoogle. Why would anybody want everything in one browser tab... Not useful at all. It would only make it so that there is not enough space for any one piece. Pretty but useless. This is really nice, i hope that they are all seperate applications or easily integrate well into the desktop they are run on, otherwise how are they different than using a broswer. Also OSX and Linux support i hope is included b/c this stuff would be easy to include (using googlegears + gecko/webkit). "everything on the desktop" really doesn't work. A Layered, easy to navigate, contextually integrated solution is a better target. I realize that is a mouthful but let's look at the mock-up for a moment. It appears to be from at least a 1600x1200 screen or more. Most real world screens are not that big. Hence, it has lead desktop applications to layered functions with a side bar or other launch mechanism. Since you don't have open and every available all the time, you must look at the most common interactions and link those. The first circle is the email-calendar-addresses (PIM) applications. Having a way to drag between the three generates your first level of integration. Next, using the user equivalent of MIME types, and conversion filter rules gives you your next phase of integration points. For example, a graphics widget understands images and video. It should move to the surface when you get an email with attachments. The basic editors should do the same. The last phase of integrating the user interface is allowing users to manipulate their "launch pad" to customize it to their own preferred layout - because we all know, you can't please everyone. The Google desktop is a great concept. There are a few experimental AJAX "desktop" sites on the internet that are a cool concept but are not quite rock-solid yet. With the resources that Google has, I am sure that the final product will be top-notch! I found a typo in the picture! Good, but we'd like to see more as you guys have Google Gears and are able to create offline CMS/doc management systems. The potential of users storing and managing files locally with synching happening when online is massive. You could serve ads to me offline if you wanted if you gave me a solo intranet, or a portal that launched when I power up before browsers even open. Remember, the war is won at home... the desktop. Google desktop is fine, so long as you have 100% net connection 100% of the time, and you don't have to pay through the nose for internet access and have both your download and upload traffic measured and charged by your ISPs! We already have that-- it's called "opening a browser window for each app". That should be all that's required. I really agree with this. I would love to see this. i hope if Google does do this then they will roll it out to the google apps folks. Everything in this screen shot works. The concept of a desktop app is to use it anywhere with any browser and any OS. In fact, you don't need no local OS (or just a very thin one). Your OS is the desktop apps backend. There is also cool implementation of windows desktop application - www.windows4all.com. I can't wait for the 3D games to hit the web too. That is when I can finally enjoy the choice of using something else besides that name Microsoft for a change, good lord I am so tired of them and their monopoly. I haven't read what other say, but I am pissed off about installing computer applications every time on every os. So I am looking forward for the online OS that doesn't require to do that. Sorry, google, but you have been beaten to it. CBOOS(Cloud-Based Online Operating System) by WPI is like having windows for free online that you can access from your pc, Mac, or phone. Unfortunately, it is still in beta but the photos are amazing.